Relax in our listed Georgian property in the picturesque village of Montacute where the historic house and square were used in the filming of Jane Austen's "Sense and Sensibility". Montacute Country Tearooms is a listed Georgian property situated in the centre of the quiet picturesque village of Montacute, yet only a few minutes drive away from the amenities and businesses in the town of Yeovil and the main A303 trunk road. This period property combines character with modern facilities including power showers and free wi-fi in a relaxed atmosphere. The village is surrounded by lovely countryside ideal for walking and cycling. Its Residents live the longest in the country! All the bedrooms are decorated in a co-ordinated neutral décor and equipped with tea/coffee making facilities, clock alarms, hairdryers and flat screen TVs with freeview and a DVD player. The en-suite bedrooms are situated to the rear garden side looking towards the trees of Montacute Park (National Trust). The en-suites have power showers, w.c.’s and wash basins. Breakfast is served in the tearooms, in the summer in our delightful conservatory. Choice of breakfast comprises fruit juice, fresh fruit, prunes, yoghurts, cereals, cooked items including traditional English breakfast and toast with preserves and honey. We serve lunches in the summer in the tearooms & garden. Packed lunches also available. 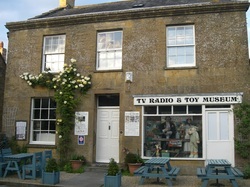 Being connected to the well-known TV Radio Toy Museum, the tearooms are uniquely decorated with pictures and nostalgic items that will bring back memories of your favourite TV programmes. Two inns in the village provide evening meals. There are delightful walks some through National Trust grounds and woods and the adjacent Ham Hill National Park. We are also on the South Somerset cycle route. Several National Trust properties and gardens are close by including Montacute House in the village. The house and village were used in the filming of Jane Austen’s ‘Sense and Sensibility’. Fleet Air Arm Museum and Haynes Motor Museum are close by. There are a number of golf courses in the area and horse racing at Wincanton, the beaches of the Jurassic coast are only 45 mins away.